Should Virginians Give Lincoln His Day? The news that the Virginia General Assembly is considering setting aside a day to honor Abraham Lincoln has certainly triggered some emotional responses. That is not surprising, but let’s not deceive ourselves in thinking that this is a question with an answer. How we approach this question will be determined by a host of factors, but this has little to do with what matters. Whether Lincoln deserves a day in Virginia will be determined by whether the sponsors of the bill can gain enough support in Richmond and ultimately among the general public. This is not about political correctness , but about political persuasion. In other words, whoever makes the best case within the marketplace of commemorative visions and can rally sufficient support will prevail. In the context of the public sphere how we as a community commemorate and remember our past has always proceeded along these lines. One of the comments on the previous post pointed out that the sponsor of the resolution is both a Democrat and African American. I suggested that it is irrelevant given that Democrats and African Americans have just as much a right as anyone to propose such commemorative events. Perhaps if the sponsor had chosen to honor an ex-Confederate general there would have been no need to bring up politics and race. I don’t know. What gives me comfort is that unlike the formative period of Civil War commemorations we now live at a time when these questions can be discussed and debated by both black and white Virginians. After all, it is a shared history. No, in my opinion, Lincoln should not get his day. The number of states that left the Union did not have Virginia until Lincoln called for troops. That was like throwing gasoline on a fire. The record of the Virginia meeting to make a decide on whether to secede or not had a majority for not seceding. It was only when Lincoln called for troops did Virginia secede. Virginia had the biggest naval base and dry docks and more. Virginia had the only Southern state foundry to cast cannon. Now if Lincoln had not called up for 75,000 then the majority of Virginians would have voted to not secede. Then the South would not have had a single foundry to cast cannon and would have lacked a Naval base with a dry dock. Lincoln should have waited till Virginia had voted on whether or not secede. Timing is everything. So you think Lincoln should have ignore the attack on the United States and just surrendered to secession? When you see anyone in your family have an argument, do you step in everytime and beat up one of the party? No, you don’t. Short of some one killing someone, you don’t go in with the intent to kill you try to get them to talk. No one was killed at Sumter. Like most divorces there is an argument as to who would get the furniture and the kids. Since no on was killed and the combatants were behaved, This was not an attack or a battle just for the fact no one was killed, the Union did not recognize the secession, and the Union was not threatened. This was a knee jerk reaction. 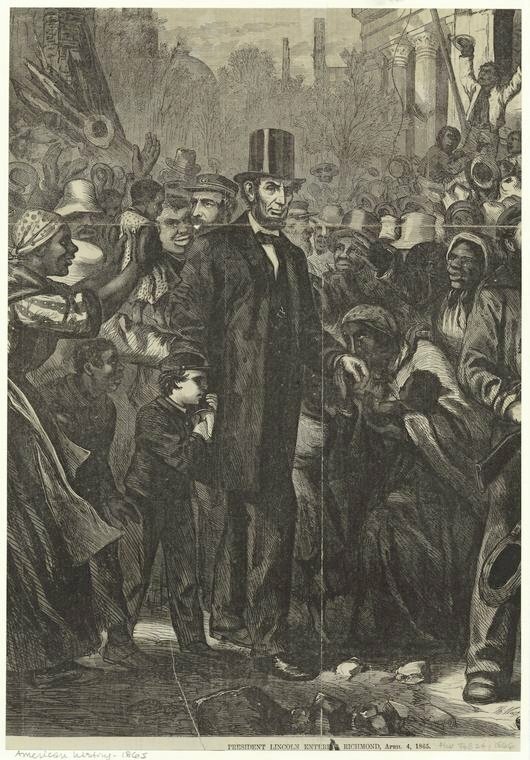 Lincoln lost control the moment he called up 75,000 before Virginia voted. This was not a battle. Someone gets killed in a battle. This was a joke. Should Lincoln have ignored the “situation”? No. But he could have bought more time for the Union if he waited till after the Virginia Secession committee had voted to stay in the Union. Lincoln could have used a carrot first and a gun latter. The US was not in peril after Sumter. After the temper tantrum at Sumter the newspaper was delivered each morning, The Union had all treasury gold at that time. The economy was still robust. What was the rush? He could have waited a few months to give peace a chance. Considering what the war did to us, it would have been a good choice. Repeat after me, the Virginia secession convention voted AGAINST secession on April 4, 1861. The vote for which you condemn President Lincoln had already taken place when he issued the call for troops. By the time, he issued the call for troops, it had been nearly 5 months since South Carolina had announced its secession, other states had joined it, the Confederacy had a Constitution, a President, and, most importantly, an army. It wasn’t South Carolina that fired the first shot at Ft. Sumter. The decision to fire on the besieged fort was made by Davis and his cabinet and the rebel troops were under Confederate army command, General P.G.T. Beauregard, who took command on March 6, 1861. This was way beyond your fantasy family tiff. 2. If Lincoln did not call up the 75,000 troops fewer states would have seceded…..
Lincoln could have had more control over the Civil War if he had not done that. Drawing a line in the sand put him in a position he could not back down from. He lost control of the whole situation. Waiting a few months would have made a big difference. Virginia did not like South Carolina and thought they were loonies. Last the 75,000 troops call up for 3 months were useless twits. Their enlistment was up before the First Battle of Manassas. Who care about the first shot fired at Sumter? No one was killed. Yes, that is amazing. No one is killed, the Fort was in tact, and they parted in good terms in 1861. In 1865 a lot are killed, the Fort is destroyed, and we got back on some very bad terms. bad aim does not not make it a battle. Nobody got killed at the Battle of Ft Sackville yet the US gained control of the “Old Northwest” butcher bill and results are unrelated. Are you suggesting that Virginia had or should have had veto power on whether or not the US Government responded to a rebellion including armed attacks on a US ship and later US forts and a siege of a US fort? In any event, your suggestion is based on an erroneous premise. The Virginia secession convention HAD voted against secession by a wide margin on April 4, 1861. However, the convention remained in deliberations and took another vote after the fall of Ft. Sumter and the call for troops. Before the second vote was taken, Henry Wise had sent Virginia Militia to seize both Harpers Ferry and Norfolk. This was more than mildly awkward since the last recorded vote by the convention was AGAINST secession and the one in favor hadn’t occurred yet, when it did occur the vote in favor of secession required ratification by the people of Virginia in a referendum, and Henry Wise wasn’t governor of Virginia any longer, Letcher was. The call for troops is often treated as something improper, as a usurpation of power by President Lincoln’s part. He acted in strict compliance with the terms of the Militia Act of 1795. He also had just taken an oath of office to ensure that the laws o the United States be faithfully executed, not just the ones that Virginia approved of him doing. I’ve seen this point made about calling up the Various State’s militias and Virginia several different places posted by several different people lately. It must be the new SCV/Lost Cause talking point. Like many of those talking points it is half thought through but very vehemently pushed , maybe in the hope that the holes in the logic, big enough for a battleship to sail through, won’t be noticed. No one was killed at Sumter! When Israel a US naval vessel in 1967 we did not go to war. When Saddam Hussein sank a US naval vessel in 1987 (or 1986?) we did not go to war. When Japan sank a US naval vessel in 1938 that was on a river in China we did not go to war. Legally Virginia did not have veto power. I suggested, that Lincoln could have waited till after Virginia had voted on secession. At that point the Union would have included Virginia. What would it have cost Lincoln to have waited 2 maybe 3 months more? This comparison is a stretch given the nature of the shots that were fired against Fort Sumter. Lincoln could have done any number of things in response to Sumter, but in the end his response reflected the nature of the attack, which he viewed as illegal and one that demanded an immediate response. To place all the responsibility for what happened at Sumter as well as its consequences on Lincoln alone seems rather shallow and uninteresting. I assume you also believe that Confederate forces at Charleston could have waited to fire shells at federal property. Yes! I agree. South Carolina was as guilty as Lincoln. I would not like a Sumter day either. It’s only a stretch if you’re inclined to make it one. The Panay incident, and all the other events listed by Gregg above didn’t provoke any response remotely similar to the one generated at Sumter. The Maine is another story, though. The bottom line for South Carolina was that Sumter was a foreign military installation which was blockading a major port. The garrison was given every opportunity to leave peaceably, and even after the fight was politely escorted away and allowed to go home. I don’t blame the Confederates for forcing the issue at all. BTW, while the Confederates were targeting an armed military installation, the defenders of Sumter were firing on civilian homes and well-marked medical facilities, and not exclusively the batteries which were firing on them. That sort of behavior became typical as the war progressed. I don’t blame the Confederates for forcing the issue at all. You’ve made that perfectly clear, which seriously reduces the value of anything you have to say about the event as history rather than as a part of a larger indictment against Lincoln. Say what? So I’m not allowed to have an opinion? How is one supposed to read history without forming an opinion? Particularly on a topic which is still as contentious as this one? The attitude I see expressed in your comment is precisely why I have tended, over the years, not to participate in discussions with academics, or those who consider themselves to be academics. It’s pretty tiresome to have your contributions dismissed, especially so when they are far from dogmatic and/or uniformed. Who said you can’t have an opinion? I am simply suggesting that the reasons/analysis behind your opinion doesn’t get us very far in understand what happened at Sumter and why. That has nothing to do with whether I am or am not an academic. Setting up and knocking down straw horses doesn’t advance the discussion. I am not an academic historian. I don’t consider myself to be an academic historic nor does anyone I know consider me to be one. I’m a retired lawyer who practiced mostly labor and employment law. I have found Kevin and his regular commenters, including but not limited to academic historians, to be courteous and welcoming. There is nothing uniquely academic about expecting people to document their positions and use rational arguments. Allen, good point on the USS Maine. That one incident will never be understood. As the story goes the USS Maine suffered a blast from inside the ship and the Spanish had nothing to do with it. Now history books have been altered to not blame any power for the sinking of the Maine. Gregg, I think it has been pretty much resolved that the sinking of the Maine was caused by a coal dust explosion in a storage bunker. But that probable fact was not nearly obvious at the time, and William Randolph Hearst and the rest of the “Yellow Press” went bonkers, pounding the war drums over the supposed Spanish perfidy. And they got their war, the first exercise in American Imperialism. At least the first one which took place outside our own borders. But I suppose that, outside of what readers may infer from the previous sentence, the sinking of the Maine and related events are outside the scope of this particular blog. Cuba was a much desired possession of many in the United States during the 19th century. The Teller Amendment concerning the US not seizing Cuba reveals some details which show some people did desire Cuba as a US possession. Following the war Cuba may have been independent, but they were practically a US possession in all but name. See the Platt Amendment for more details on that. Without a doubt the Spanish-American War became a war that helped launch US imperialism. Fort Sumter did very little shooting in reply to the attack on it. The Liberty was a spy vessel spying on a country at war. a far different event an attack on a military instillation. the Japanese apologized for the Panay and paid a reparation for what they insisted was a mistake. Margret, I am entitled to my opinion. An opinion is not a fact. Facts can be erroneous however opinions, belief, and faith are not based on right or error. Please madam, I did state an opinion. Be nice, please. An opinion unsupported by fact is guesswork, faith, or fiction. In this case, you are criticizing President Lincoln’s decision, specifically the call for troops. However, your “opinion” not only is based on a erroneous assumption, that Virginia had not voted on secession at the time of the call for troops, but you refuse to even acknowledge when it’s pointed out to you that Virginia already had voted in convention and had rejected secession at the time of the call for troops. The convention stayed in session and voted a second time, after the call for troops, with the vote going for secession except for the delegates from the NW counties. You point to Virginia’s manufacturing facilities that would have been deprived to the Confederacy if Virginia had not joined the rebellion. However, the administration had been in discussions with Virginia and it was very clear that Virginia based staying in the Union on no military steps or anything else that VA regarded as “coercion” being taken. This, effectively, would have meant that the US government would treat an independent CSA as a fait accompli whether it formally recognized the CSA or not. If that had happened, the Confederacy would not have needed Virginia’s factories to fight a war since no war would have occurred. If besieging a US fort , trying to starve its garrison out, and bombarding it when it refused to surrender wasn’t enough to get the US government to act, then there would have been little for a rebel state to fear. You also fail to acknowledge the rage in the free states over the bombardment and surrender of Ft. Sumter that some historians have likened to the 1941 reaction to Pearl Harbor. Labeling what you say an opinion does not mean that no one will challenge it and engaging in civil debate is not inconsistent with niceness. Carrot or Stick Margret? W with honey than lemon juice. Carrot or Stick Margret? Win more hearts and minds with honey than can be won with lemon juice. Compare Pearl Harbor to Ft Sumter? Can’t imagine the comparison. 1. Pearl Harbor was a surprise. Ft Sumter knew what was coming and prepared for it by abandoning other fortifications and spiking guns. No surprise here. 2. Pearl Harbor had a lot of people killed. Ft Sumter had no one killed. 3. Pearl Harbor was attacked by a foreign power. Sumter was not attacked by a foreign power. Now that is an “erroneous assumption”. Last, no, you are wrong. No one argues that Virginia voted to not secede before Sumter. No argument on that point. But it is accurate that Virginia did vote for session after Sumter and that was the result of Lincolns calling for 75,000 troops. The comparison she made was to the civilian reactions to Fort Sumter and Pearl Harbor, not to the events themselves, which as you point out were quite different. Va made its choice and came to regret it as it was the scene of a very destructive and bloody war they, by obeying the Constitution could have avoided,. SC and Va made bad and illegal choices, they paid the price. Actually, that’s not what you said, or suggested. You asked “why should it matter”, and I replied that I didn’t say it did. Just click the link you provided in your commentary above and see for yourself. Now, I harbor no delusions when it comes to my ability to write on the same level as you. But I do try to be precise in my choice of words. Must be that legal training. To answer your question, no, I do not think Virginia should set aside a day for Mr. Lincoln. I’m sure the state already participates in the federal “President’s Day” holiday, which should be more than sufficient. And yes, I know that “President’s Day” is not the official designation. I was suggesting that it was irrelevant when I inquired as to why it should matter. The title of the post was not really meant to poll people on where they stand, but to point to larger issues at work. The Commonwealth of Virginia may do as she pleases with Lincoln. I kind of like Lindsay’s arguments from the previous comment thread. Who cares if Mississippi celebrates Robert E. Lee? I’d like to know how a Nat Turner day or Richmond memorial row statue would go down. Or to any of the other slave rebellion leaders in Virginia’s history. Who cares if Mississippi celebrates Robert E. Lee? I was simply pointing out that a physical presence is not always necessary to bring about a commemoration. The bottom line is this. Anyone can suggest that we commemorate anything. This was put to a vote and democracy won. Virginia decided not to give him a day. You obviously didn’t read carefully enough. Nothing was put to a vote other than to decide against a joint Washington – Lincoln Day. There is a resolution pending which you can read in the previous post. We shall see whether it gets sufficient support. Thank you Kevin. I stand corrected.